A Ross-Shire youth group have joined the cyber age in an effort to attract new members. Fairburn Scout Group have launched a new website - at http://www.fairburnscoutgroup.org.uk - which enables parents, children and anyone else who is interested to view their activities online. 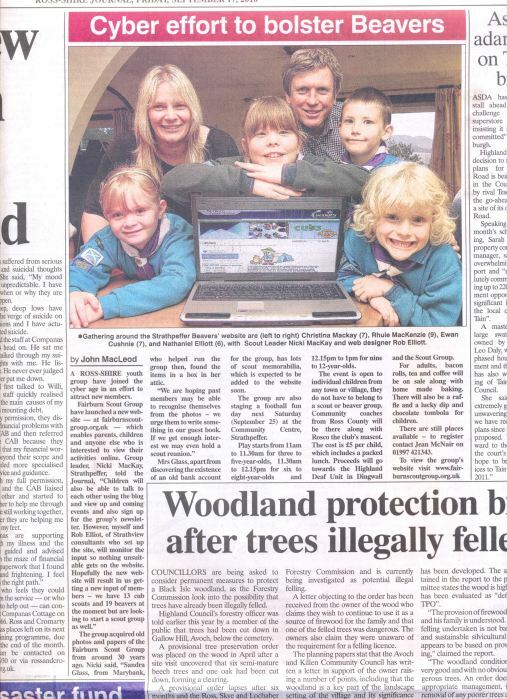 Group Leader Nicki Mackay, Strathpeffer, told the Journal: "Children will also be able to talk to each other using the blog, view up and coming events and sign up for the group's newsletter. However myself and Rob Elliott, of Strathview Consultants who set up the website, will monitor the input so nothing unsuitable gets on the website. Hopefully the new website will result in us getting a new input of members - we have 13 cub scouts and 19 beavers at the moment but are looking to start a scout group as well". Hopefully they gain a lot of members.